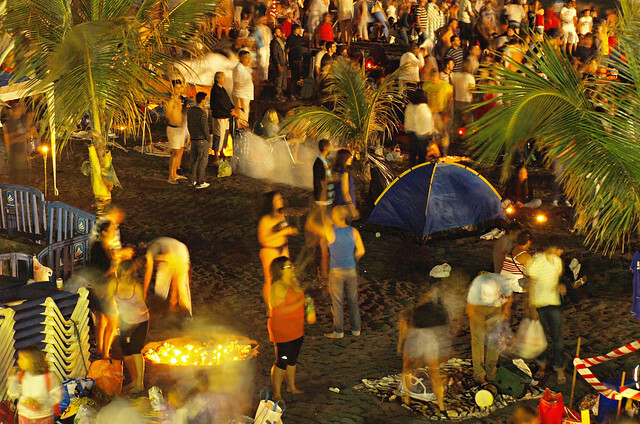 Last year we experienced the Noche de San Juan in the south of Tenerife for the first time. We were staying in Costa Adeje because of work, if you can call following top DJ Jacobo Padilla around some of the best chill out bars in the south of Tenerife work. On Midsummer’s Eve (the other name for the Noche de San Juan) we found ourselves, mojitos in hand, lounging on a Balinese bed at the Bahia Beach Club in Palm Mar watching the sun set behind a haze of heat from a couple of braziers whilst listening to chill out sounds and being occasionally distracted by the gyrations of a couple of belly dancers. It was most enjoyable, but a very different San Juan than we were used to. Celebrating San Juan is a big thing on Tenerife, especially in places where traditions are strongest and reach back centuries. 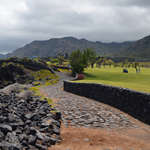 Its origins lie with the island’s aboriginal people the Guanche who, like many primitive civilisations, believed that the sun cast powerful magic when it was at its midsummer peak. 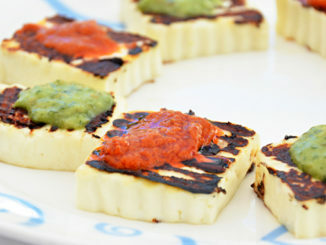 Another name for the San Juan celebrations is the Fiestas of the Sun. 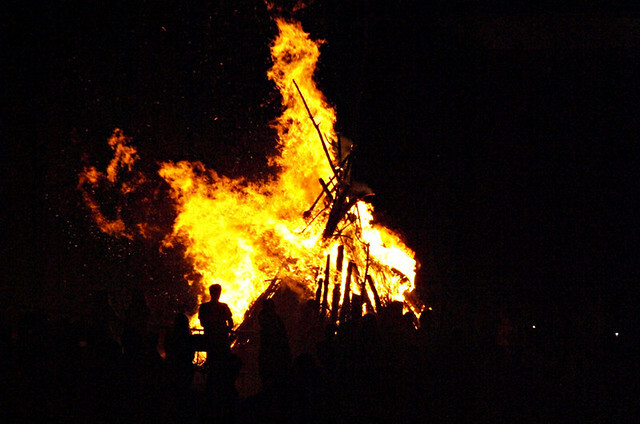 Festivities begin on the 23rd June, the eve of San Juan; a night of fire festivals and love magic when the twin elements of fire and water have potent qualities and, legend has it, whatever is dreamed will come to pass. In towns on Tenerife’s northern slopes, figures, festooned with flowers, and bonfires are set alight; the Guanche believed flames from fires added strength to the sun. In some towns in the Canary Islands young men practice the custom of leaping over bonfires to demonstrate their prowess… which is left in tatters and slightly singed if they don’t actually clear the flames. 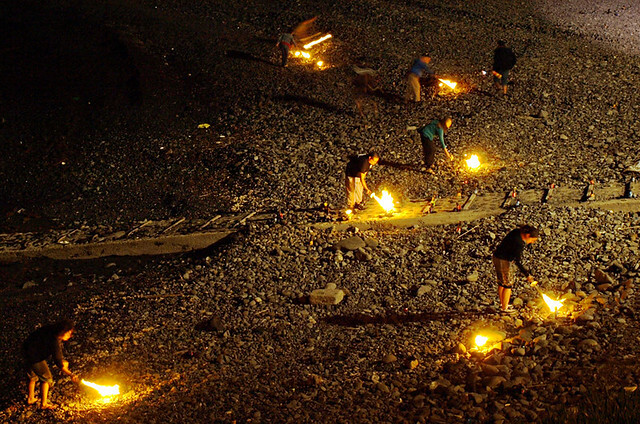 All over Tenerife, people take to the beaches, or light fires in the hills, to celebrate. What form that celebration takes varies from location to location. In less traditional areas it can be more of a casual beach party. In other places there are more obvious links with age-old customs. 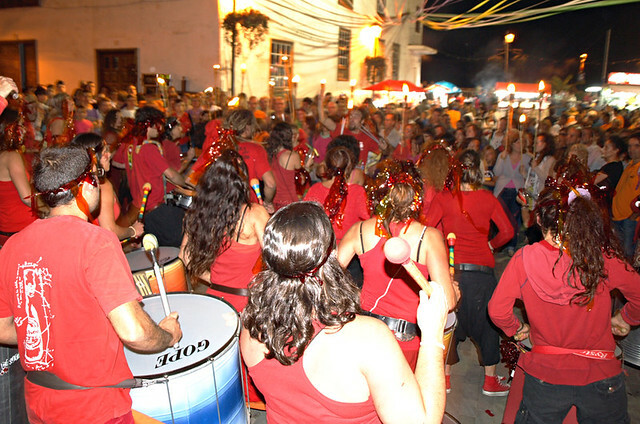 Normally we celebrate the Noche de San Juan in Puerto de la Cruz. There is usually a huge beach party with live music, various events, fireworks and a mass bathing at midnight. The Guanche believed the sea at midsummer was bubbling with magic; bathing in it as Midsummer’s Day dawned ensured good fortune for the coming year as well as rejuvenating skin, banishing harmful spirits and guarding against illness. The magic water is also supposed to be a strong source of fertility. It would be interesting to know if there was a baby boom on the islands every March. It’s also claimed that anyone who stays awake to see daybreak will hear a chorus of mermaids before the mythical island of San Borondón appears briefly on the horizon. Like I said, the Midsummer scene is so good in Puerto de la Cruz that it has proved difficult to drag ourselves away to see what happens elsewhere. But we have and although what we’ve seen has been on a smaller scale in other places, it’s still been fascinating and fun. For a start, there can be a post-apocalyptic vibe as you drive along the north west coast where black plumes from multitudinous fires makes it feel as though you’ve entered the domain of warring tribes (yes, I do have an over-active imagination). In a tucked away cove at La Caleta de Interian near Garachico we watched locals carefully lay out fires along the curve of a small bay. 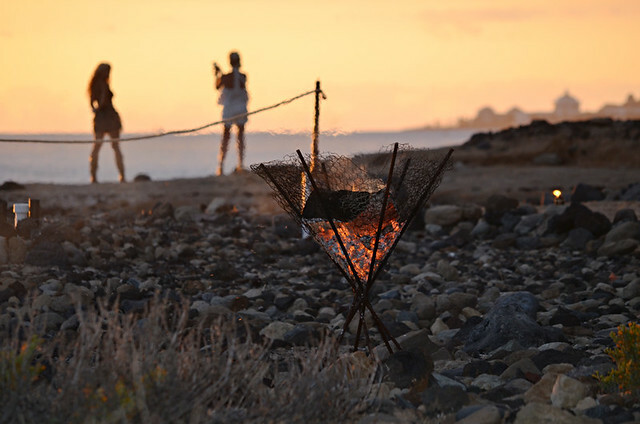 As darkness fell the fires were lit, creating fiery smiles on the sand. It was intimate, relaxed and totally enchanting. In Garachico itself we ran a gauntlet of sparks and cinders to get home as they’d lit a huge bonfire right beside the main road through the town. Not quite as mad as when they throw fireballs of the hills but in a similar vein. One of the nicest and most atmospheric Noche de San Juan scenes was in San Juan de la Rambla where torch-lit processions through the town’s historic centre, painted faces and a soundtrack provided by batucada drums and conch shells gave it a distinctly Guanche air. 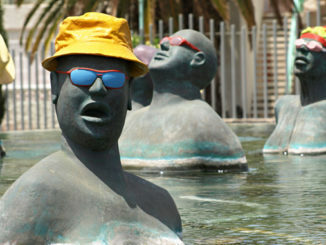 And so, different places across Tenerife celebrate Midsummer’s Eve in their own way. The one thing that’s sure to be consistent across all of them is that it will be colourful and fun.